"Iran aggressively pursues these weapons [of mass destruction] and exports terror, while an unelected few repress the Iranian people's hope for freedom. ... States like these, and their terrorist allies, constitute an axis of evil, arming to threaten the peace of the world." In his State of the Union address on Jan. 29, President George W. Bush uttered words that may have altered the course of U.S. relations with Iran -- and the rest of the Middle East. What is the U.S. case for including Iran in the "axis of evil"? 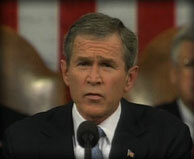 What impact has Bush's speech had on Iran, and what does it mean for the U.S. war on terrorism? The U.S. charges Iran with sponsoring terrorism, pursuing weapons of mass destruction, exerting a destabilizing influence in western Afghanistan, and possibly harboring Al Qaeda fugitives. Here's an interactive map and an overview of the U.S. case against Iran, as reported in recent months. What's become of President Mohammad Khatami's call for "dialogue among civilizations"? Azar Nafisi, an Iranian scholar at Johns Hopkins University, discusses the prospects for dialogue and mutual understanding between the U.S. and Iran. Does Iran belong in an "axis of evil"? Is the cause of reform in Iran being helped or hindered by the U.S. war on terrorism? What happens next? Here are the views of the former Bush speechwriter David Frum, who is said to have coined the "axis" phrase; U.S. Senator Joseph Biden (D-Dela. ), chairman of the Senate Foreign Relations Committee; Iran's ambassador to Canada, Mohammad Ali Mousavi; New York Times reporter Elaine Sciolino; former CIA Director James Woolsey; Iranian Vice President Massoumeh Ebtekar; the reformist Grand Ayatollah Yusef Saanei; Jessica Mathews, president of the Carnegie Endowment for International Peace; and Thomas Pickering, undersecretary of state for political affairs during the Clinton administration. The U.S. State Department says that Iran ranks as the world's foremost state sponsor of terrorist organizations. What is the evidence against Iran? How do Iranian officials respond to such accusations? Here are excerpts from FRONTLINE's interviews with former CIA officer Robert Baer; Grand Ayatollah Yusef Saanei, an influential reformist cleric and protégé of Ayatollah Khomeini; Iran's ambassador to Canada, Mohammad Ali Mousavi; Iranian Vice President Massoumeh Ebtekar; Elaine Sciolino of The New York Times; and David Frum, the former speechwriter for President George W. Bush who is said to have authored the phrase "axis of evil." The CIA identifies Iran as "one of the most active countries" pursuing weapons of mass destruction. Yet Iran steadfastly denies that it is seeking to build nuclear weapons. Is the threat real? If so, what should the U.S. do? And does Iran, bordered by Iraq and Pakistan, have good reason to want its own nuclear arsenal? Here are the views of former CIA Director James Woolsey; Iran's ambassador to Canada, Mohammad Ali Mousavi; nonproliferation expert George Perkovich; former undersecretary of state for political affairs Thomas Pickering; and Jessica Mathews, president of the Carnegie Endowment for International Peace.